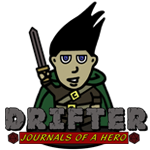 Drifter: Journals of a Hero is a Fantasy-genre comic told by a man known as The Drifter. He sits down to write the story of his life and the comic series is his life story. The art style of the comic is based on many of my favorite SNES video games from growing up in the 1990s. There will be many times in the comic where I try to parody different games or other things.